Today I would like to share a few things I love about the fall season. As many of you speak of fall ~ we are saying good-bye to summer, and the carefree days. I remember moving into September as a young mother, and having to start that “routine” again. Getting the girls use to going to bed early for their early morning wake up. It was a bit of a hassle, but we always seem to come around by October. Beautiful sign ~ go here for directions. 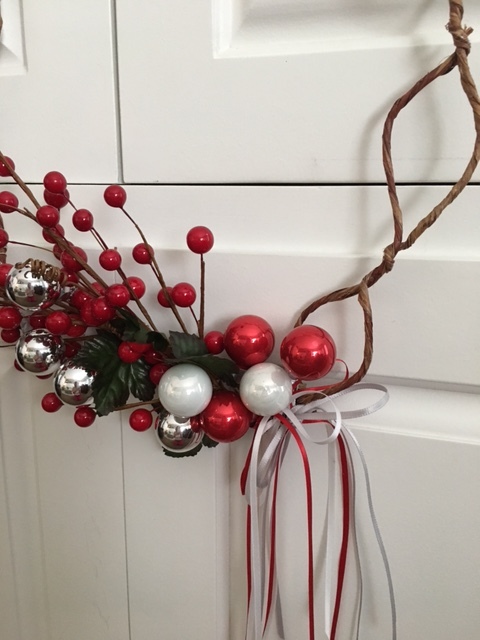 This sweet wreath is so easy to make ~ I will be making this one. I’m bringing something new to Etsy in a few weeks. They are self binding receiving blankets & matching small pillow. So many times I look to Pottery Barn for inspirational ideas. I usually wind up spending money on something I could make myself. Today I was looking at the pillows on our Family Room couch, and wanted to change them for the spring & summer months. The navy blue pillows are very nice, but I thought maybe a little lighter for the warmer weather. I have this material……So…….decided to make it myself. After cutting the material I realized I was 3″ to short. What to do now…….I have the same material in red & cream – so I made a 3″ ruffle, and added vintage buttons. I love it. The same, but with a little twist. Tomorrow I will finish the other one. Hope you are having a wonderful evening. I decided to change the shower curtain in the guest bath, so along with the shower curtains came garbage pail, tissue holder & soap pump. The guest room is directly across from the guest bath, so having them the same colors well you know how that is. I looked for 2 towels to go with all of the above. I was having a bit of a problem trying to find just the right color. Finally Bed Bath & Beyond had the perfect pink. Pretty – YES – but, it needed something else. I had some ribbon in pink and green, but not the right pink or green. Then I came across a lace that you can put ribbon through. Aah!!! that’s a perfect match. Ten minutes later you have this. My new sewing machine is amazing. It actually lets you know when you are getting close to a pin. That to me is close to perfect. If anyone is in the market for a new sewing machine look no longer. It received so many good reviews, and the price was just right. I’m still learning how to use many of the features, but youtube is great for this. I know I am late reopening my Etsy store, but it will be reopened on May 10th. The first new piece of information – I am putting lots and lots of pretty little hearts in my store. The hearts measure 4.5″ x 4″ ~ They all have vintage lace, and vintage buttons. Each month there will be a special heart and that heart will be given a name and a 10% coupon discount which will appear in my Etsy store. The button on this heart is made from a coconut, and it looks like a coffee bean. The fabric is coffee cups, and the same color little hearts. This one has little bumble bee, and sunflowers. Here is the back ~ And it does remind me of an English Garden. Both way are so pretty. Hope you will enjoy these pretty little hearts. Garland for the Christmas tree. I saw this on Pinterest, and thought this would look so nice on our tree. I have been wanting to put garland on our tree, but it had to be different. Piece of cardboard or thick paper for under the ribbon ~ this is so you do not get the paint on your surface. The paint will bleed through the burlap. 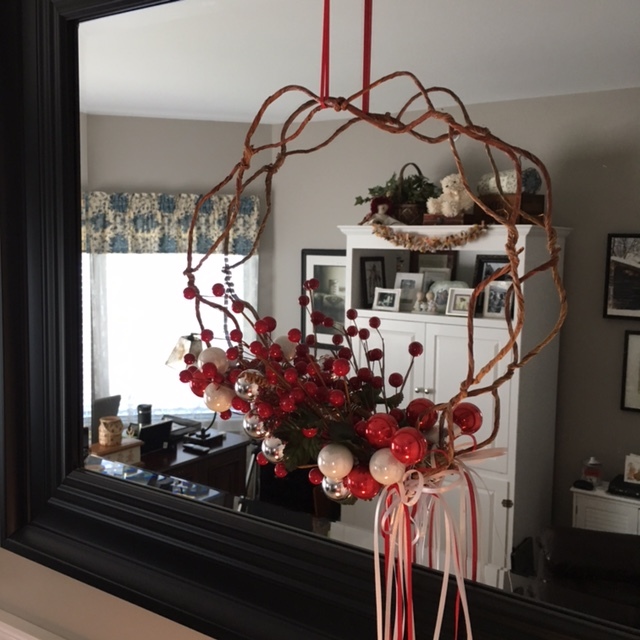 How I made the garland. Found the ribbon which is very fine burlap at Michael’s ~ It had the edges frayed already. This will saved a bit of time. Placed the stencil in the center of the ribbon and taped both ends to the burlap ~this way the stencil does not move. Let it dry and rolled it back onto the spool it came on. This entire process took about 45 minutes. I am so happy with the way this turned out. 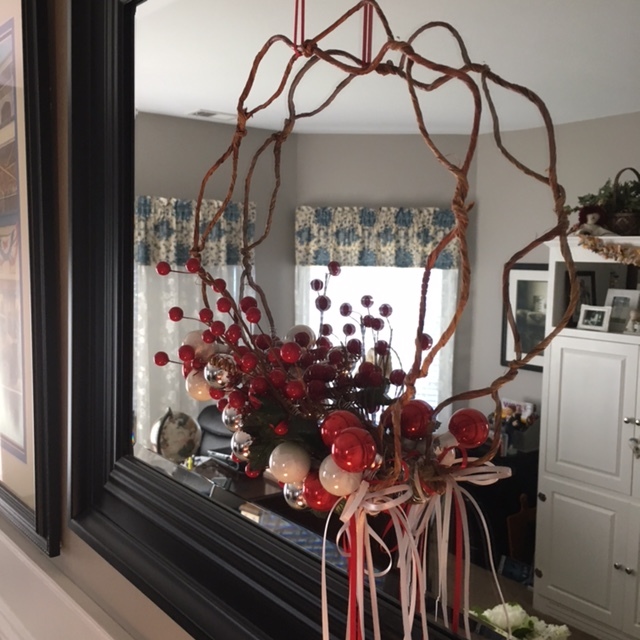 I will be posting my Christmas Home Tour after Thanksgiving. 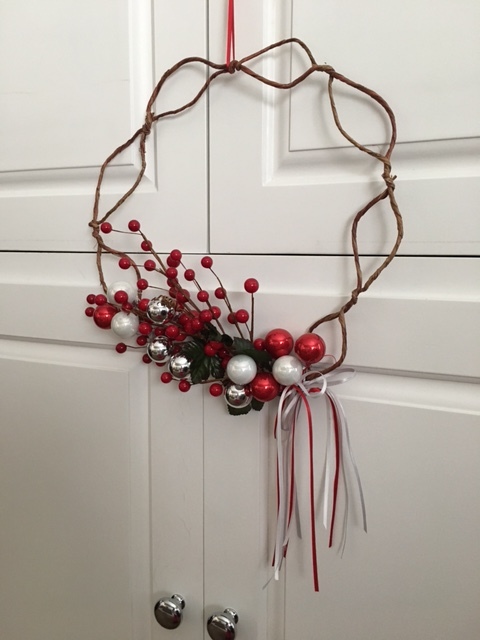 Today I am sharing a sweet twine Christmas wreath with you. My first of many projects for Christmas. I have enough twine left that I will be making another one for spring and summer. 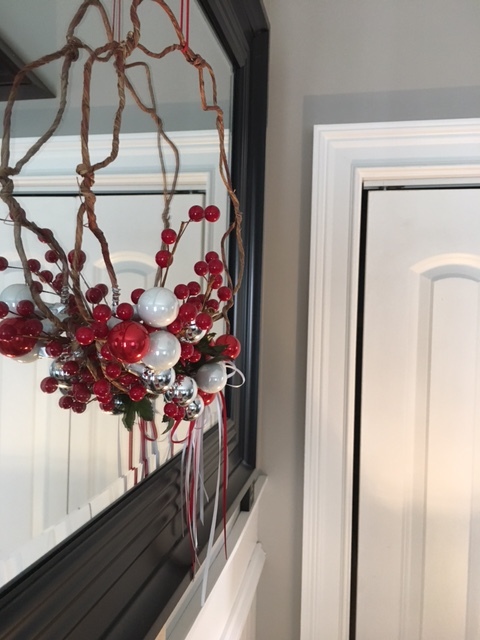 Tiny Christmas balls – Can not find the link- but they are also at Michael’s. They come in a small plastic case – 12 pieces Wreath Ornaments. Hope this inspires you to make something sweet for Christmas. I have been working on these Sweet Christmas heart ornaments for a couple of weeks now. Cost is $7.00 each with lace ~ $6.50 without lace. They are now in my Etsy store.